Following are 10 reasons that hyperinflation is coming. 1.Global oil production will peak between 2005-2008. Economic growth ceases to exist as global economies and markets are thrown into chaos and turmoil. 1A. Sorry Jim, peak oil is a resource phenomenon not a monetary phenomenon. It is no more inflationary than is soybean blight. BTW rising oil prices are probably deflationary if anything. Excess driving will come to a halt as will hotel bookings and airline travel. Bankruptcies and layoffs will both soar. The net affect of that is deflationary unless you are going to tell me that wages and jobs will rise to meet rising gas prices. Since that has not happened on the rise in crude from $25 to $60, pray tell why will wages rise if crude rises to $100? 2A. My answer is the same as in 1A above. 3. Debt creation and monetization hyperinflates as the government’s deficit spirals out of control with a war and a depression. 3A. What about debt creation in Japan, China, Europe, and the UK? Exactly who is going to war against who? Prices are going to rise in this "depression"? Why? Is China going to raise prices? If so, where are the jobs going to come from for US consumers to buy Chinese goods? 4.Foreigners begin to bail out of the dollar setting off a dollar crash. 4A. They are going to bail and buy what? Euros? The pound? Yen? Why, why, and why? Japan has debt equal to 250% of GDP, the UK is 6 months ahead of us in their housing bust and has a huge % of public sector workers to boot, and the EU seems to be in political shambles at the moment. Tell me exactly what everyone is going to buy when they start bailing. 5.The US puts in place capital controls to corral US and domestic money. The War on Terror will be given as the reason. 5A. I am not exactly sure what this would do so I take a pass and will think about this one later. 6.The government takes over GSEs owning most American mortgages. 7. A national mortgage bailout bill is passed lengthening mortgage payments in an effort to forestall debt defaults. A new restructuring agency will be set up to repurchase impaired mortgages from the banking system and renegotiate terms of the debt to avoid default. The 100-year mortgage is born. 7A. Ok so a 100-yr mortgage is born. How does that cause prices to rise? Furthermore, a near universal criticism of Japan was the fact that Japanese banks kept bad loans on the books for years, refusing to write them off. Now you are suggesting that when we do the same thing it will cause hyperinflation even though it clearly prolonged the deflation in Japan. Sorry Jim, I do not buy it. 8. A national retirement security act is passed forcing private pensions to buy long-dated zero-coupon government bonds that will be inflated away. The reason given will be for plan protection against bear markets. 8A. Assuming such a bill is passed (I seriously doubt it) but for the sake of argument I will assume it happens. Pray tell exactly how is that hyperinflationary? How and to what extent would it increase the money supply or cause prices to rise? 9.As the US economy goes into a hyperinflationary depression the rest of the world’s economies follow suit. Money printing on a grand scale occurs in western and Asian economies as governments wrestle and try to satisfy the demands of a social welfare state and an angry, aging populace. 9A. The entire world goes into a hyperinflationary depression at the same time. Hmmm do home prices head to infinity? Is everyone buying homes at these prices taking out 125% loans going to be bailed out? Are jobs going to be so abundant in this worldwide depression that everyone has enough money to buy things with? In your model do Congress, bankers, and the credit card companies all stand back and watch this happen? How nice of inflation to bail out all of the debtors at the expense of powerful creditor like banks. 10. As governments hyperinflate and debase their currencies, gold will take on its true role as money rising in value against all currencies. The world will move towards a global currency backed by gold. 10A. Here is how I see it: As debt everywhere is repudiated in a deflationary crash, the grand experiment in Fiat money backed by nothing will lead to reinstatment of the gold standard or a gold/silver standard and once that debt is all wiped clean and we start over from a complete K-Cycle deflationary debt purge, then we can see inflation take off. Yes you do need say more because you completely failed to address the questions posed by deflationists such as myself in a believable scenario. Furthermore, the above four points simply can not be considered a serious attempt to consider or understand the deflation arguments especially those presented in Same Data / Different Interpretation. On the other hand, I freely agree with much (but not all) of what you have had to say about the CPI being understated, that deflationists (and others) do not understand what money is, and that hedonics, imputations and productivity all need to be appropriately factored in. We seem to also be in general agreement about gold, but for reasons that are 180 degrees apart. Not a single hyperinflationist (most of them oddly enough point to the debt bubble and expect a housing crash, both of which are inherently deflationary in nature) has been able to explain how home prices keep rising, jobs are lost in the upcoming recession, wages keep falling because of outsourcing, bankruptcies soar, etc etc etc and we end up with inflation. I still feel that I have not gotten a credible reply, given my challenges to the 10 reasons for hyperinflation presented above. Falling home prices, and the resultant slowdown in trade jobs coupled with rising unemployment are the Achilles’ heel of inflationists. They can not explain how this scenario leads to further inflation. Nor can inflationists tell me how home prices can keep rising as long as we have global wage arbitrage, falling wages, and loss of jobs. Home prices can NOT rise above wage growth over the long haul! The destruction of credit and money along with an increasing number of bankruptcies that will accompany a significant downturn in housing is the very essence of deflation. Now perhaps the above 10 items were meant to address the issue but I believe most of the 10 points are easily refuted as I did above. Oil is easily dismissed and is in fact an argument for deflation if you come right down to it. I am not the only one who feels this way. It seems Bill Gross is in my corner with his July 2005 outlook entitled Fire! "The Fed may soon be out of fuel, despite hints of Bernanke-style helicopter money. Stocks and houses are already at low yields and high prices reflective of European economies nearing Japan-style liquidity traps. If the asset pumps run dry and the kerosene cans empty, the inevitable path of the U.S. economy will reflect slow growth at best and recession as a realistic alternative. Inflation then would return to low 1% levels in the ensuing years and be pressing the deflationary crossover line. Nominal Treasury paper would enter the 3-4% zone for 10-year maturities and lower still for shorter intermediates. Such an analysis argues for capturing yield via duration extension now in the face of admittedly artificially low current yields. If Rome burns, long maturity bonds will rule the day and that day may come sooner than many imagine possible." The theory that the entire world going into hyperinflation at once certainly seems to require massive world-wide hiring and wage growth. Unless that happens where are people going to get money to buy things? The argument that forestalling of debt is hyperinflationary must be dismissed since it did nothing but prolong Japan's agony. The last stand of hyperinflationist seems to be some scenario in which governments all over the world do some sort of "helicopter drop" to bail out all the debtors. Sorry Jim that is just not plausible if one considers the real world implications. Hyperinflation would bail out debtors at the expense of banks, credit card companies, and other creditors. Are banks going to want or allow that? Would Congress allow it? No, in fact Congress went the other way. Congress passed a bankruptcy reform bill that will have consumers owing money to the company store from now until doomsday. A key point to remember is that when Greenspan slashed rates to 1% he was bailing out banks not consumers. Corporations owed money to banks as did numerous foreign nations. Greenspan kept rates low enough, long enough to enable corporate balance sheets to be restored and bank loans to corporations to be repaid. Now it is consumers not corporations that are deepest in hock, and the primary creditor is GSEs not banks. That is a huge difference and I find it silly at best to think that money will be dropped from helicopters (or given away in massive quantities) to bail out consumers at the expense of banks and other creditors. Bill Gross does not find the Bernanke Helicopter Drop theory plausible and neither do I. The K-Cycle is not likely to be defeated by throwing more money at the problem. At some point lenders refuse to lend or borrowers stop borrowing. That time will be at hand when housing plunges. Look at current events in the UK as a prelude for what will happen here. Point #7 above is a new one so let's take a good hard look at what happened in Japan, and what is happening in the UK right now. Here is a good link to consider: Bank warns on threat to economic stability from consumer debt. "The Bank of England will today issue one of its clearest warnings to date of the risk to the UK's financial system from the surge in consumer borrowing. In its key twice-yearly review of financial stability, the Bank says banks had been caught unawares by a sudden jump in the number of debts that had to be written off, particularly on credit cards. It says lenders reacted by tightening their criteria - a move which could aggravate the current sharp slowdown in consumer spending. The warning comes as the Bank for International Settlements (BIS) - the central banks' central banker - warned that rich countries' financial sectors faced 'significant macroeconomic risks'. Sir Andrew Large, the Bank's deputy governor, said recently while the near-term outlook was 'generally healthy', there were some concerns on the horizon. He said: "There are signs that areas of credit risk may be underpriced and the liquidity of some assets could prove illusory in stressed conditions." Hmmm. Bankruptcies increasing and credit standards tightening. Sounds like classic liquidity trap action to me. Perhaps hyperinflationists believe "It's different this time". Here is another point of view to consider. Stephen King: Low interest rates can point to deep-rooted weaknesses. "Interest rate cuts are back on the agenda. It's a surprising result, given how low interest rates already are. Not everyone has got there yet. Only two of the nine members of the Bank of England's Monetary Policy Committee have so far voted in favour of a rate cut. And, although Jean-Claude Trichet, the president of the European Central Bank, seems to be willing to think the previously unthinkable, his colleagues are likely to delay a move downwards in European interest rates until later this year. Low interest rates are not the cause of high inflation; they are a consequence of low inflation and, for that matter, low inflationary expectations. Overall, the US looks a bit like the UK a year ago: growing imbalances but a lack of transparency on precisely when the economy will begin to stumble. Underneath all this is a failure to come to terms with the post-bubble world we are living in. The basic truth is that, post-bubble, life is tougher. No longer do people have the supposed guarantee of ever-lasting capital gains and, hence, endless jam today, tomorrow and for ever. But how have we reacted to this new truth? Consumers pretended it wasn't there: they continued borrowing, helped along by rising house prices. Policymakers hoped it wasn't there: by setting interest rates at low levels, they created the illusion of ever-rising house prices to offset the earlier illusion of ever-rising stock prices. Pension funds assumed it wasn't there: they were happy to pretend the 1990s would return because otherwise their unfunded future liabilities would begin to look extremely daunting. As reality dawns, there is a price to pay. High debt and low savings will be gradually replaced with low debt and high savings. As economies structurally come to terms with this change, interest rates will end up at very low levels. But low interest rates will not be an indication of monetary laxity. Instead, they will simply be telling us people would rather save than spend. Low interest rates might seem to be desirable but, in these circumstances, they point to deep-rooted fundamental economic weaknesses. Just ask anyone living in Japan. Stephen King is managing director of economics at HSBC"
Sorry Jim, but a housing bust will lead to a deflationary recession not a hyperinflationary one. All signs point that way. Your 10 points fail to address the above 7 deflation arguments in any sort of plausible manner. My offer to bet a box of steaks on the outcome is still on. Well perhaps it is mysterious but it is not an "Order". The facts in the article are slightly wrong as well. My source at Alaron shows slightly over 26,000 August 445 calls (not 450 calls as the article states). That is indeed a huge number. The thing to remember about August gold calls is that they expire in July. In fact, those calls expire 26 days from today, June 20th. Assuming my math is correct they expire on July 25th. In my opinion 445 is likely to serve as a CAP on gold prices unless gold can convincingly break up thru that range. I suppose it would be ironic if gold blasts off just as soon as those calls expire. Perhaps someone was making a bet the FED would change its language today. If so, that bet failed. From a seasonality standpoint, I believe those calls expire just a tad early for the normal August rally. OTOH, if gold can get a strong rally going in the meantime, the seller of those calls is going to be sweating big. Don't count on it. UK Q1 GDP revised down sharply for the first quarter of the year further strengthening the case for an interest rate reduction in the coming months, official figures confirmed today. "In its quarterly national accounts, the Office of National Statistics revealed that UK GDP during the period grew by 0.4 pct from the previous quarter and 2.1 pct on a year-on-year basis. Both were downward revisions from rises of 0.5 pct and 2.7 pct respectively. The latest adjustment shows that economic growth was below its long-run average in the first quarter -- the so-called quarterly trend rate of 0.6 pct. On the expenditure side of the national accounts, the statistics office said household expenditure growth was revised down sharply to show the smallest growth since the last quarter of 2000. It revealed that household expenditure rose by just 0.1 pct in the first quarter, down from the 0.3 pct provisional estimate. Meanwhile, government expenditure continued to rise at a steady rate of 0.7 pct in the first quarter from the previous quarter --- unchanged from the previous estimate." UK interest rate futures soared on this news, with front month contracts rallying far more than the back month contracts that already had started to price in multiple rate cuts. The Sept 05 Short Sterling contract rose 10 bps, Dec 05 rose 8 bps, March 05 rose 7 bps, June 05 rose 6 bps, and Sep 06 rose only 4 bps. Traders are increasing willing to bet that the next move in the UK is a cut, and that cut is coming sooner rather than later. A full quarter point cut for September 2005 is now priced in. Pay particular attention to the fact that UK consumer spending has weakened and that Retailers are pleading for a rate cut. "Hard-pressed retailers were last night demanding an immediate cut in interest rates from the Bank of England after the CBI reported that conditions on the high street were at their bleakest for more than two decades. The CBI called an unscheduled press conference to report that consumer belt-tightening meant 42% of retailers saw business in June down on a year earlier, while only 23% said it was up." Indeed there is a far bigger correlation between consumer spending and home prices than consumer spending and stock market gains. 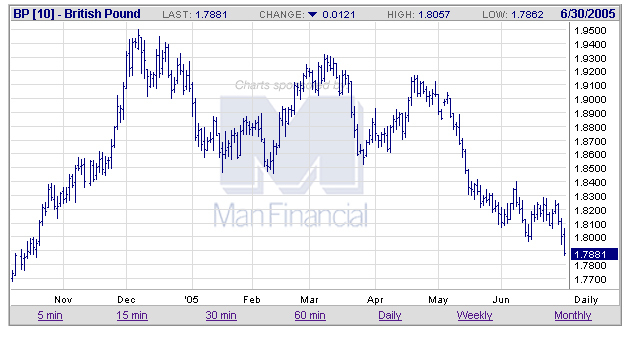 The British Pound was hammered on this news, falling to 1.782 at the time of this post. Following is a daily chart of the British pound. Also note that the UK Q1 current account deficit worsened to 5.8 bln stg vs 4.1 bln in Q4. US dollar bears need ponder this: The UK has now recorded a current account deficit for every quarter since the third quarter of 1998. The EU is in shambles, Chinese banks are deep in trouble, and the UK does not exactly seem to be such a pillar of strength either. Everyone wants (or do I mean expects) the US dollar to fall, but there is not another currency worth buying. 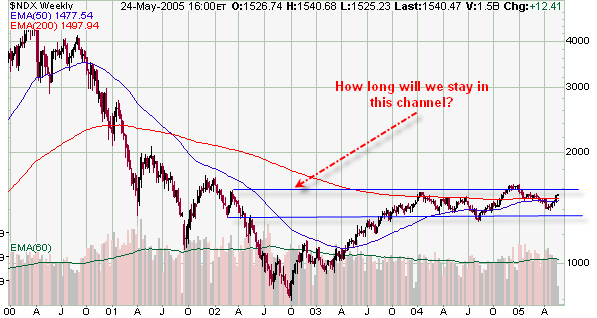 Of course this bodes well for gold over the long haul. One of the reasons gold has begun to rally in other currencies is simply because there are few other places to hide. Finally, Forbes is reporting that UK June consumer confidence index fell to -3. "Consumer confidence in June fell for the third month in a row as Britons became more nervous about the prospects for the general economy, according to a monthly survey from GfK Martin Hamblin. GfK's headline index fell to -3 in June from -1 in May, well below expectations for the index to remain unchanged. Meanwhile, the sub-index measuring perceptions of the general economic situation in the country over the last 12 months slumped by five points to -18 in June from -13 in May, GfK said." Bear in mind, all of this should have been completely expected. More to the point it is exactly what people should be expecting to happen in the US as well. No one seems to think a recession is around the corner in the US, the masses do not see the hammer that is going to hit them over the head in housing, and US stocks certainly are not priced for either pullbacks in consumer spending or a US housing bust. Everyone seems to think that Greenspan can pull another rabbit out of his hat. I have news for everyone: there are no more rabbits left in Greenspan's hat, and when rate CUTS start happening in the US, they will not have any affect. 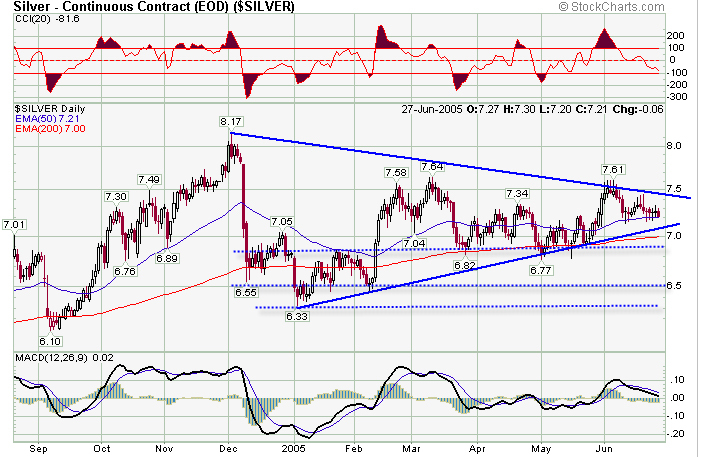 Following is a weekly chart for silver. 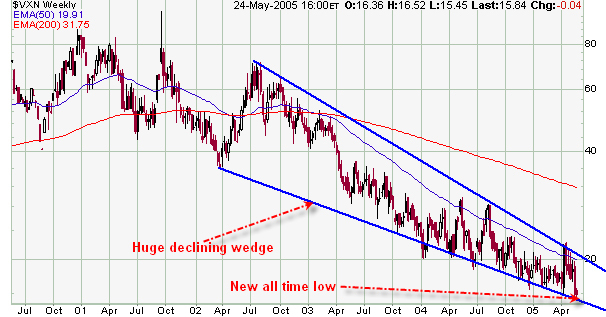 Here is a close look at the wedge on a daily basis. Click on the chart for an enhanced view. No doubt everyone is anxiously watching that wedge to see which way it breaks. Here are the near term factors at play. 2) Will the FED pause, stay the course with measured hikes, change their bias, point strongly at the housing bubble while insisting that everything else is OK, or what? All eyes will be on the FED to see if they change their bias now, and/or pause in August or September. 3) Short term action. Once again the $HUI seems to be struggling at resistance. A healthy correction back to say 180 might be a good thing, not a bad thing. 4) COTs now seem neutral at best in gold and silver. Gold commercials are now almost 200,000 contracts short. This is a dramatic change from just a few weeks ago. 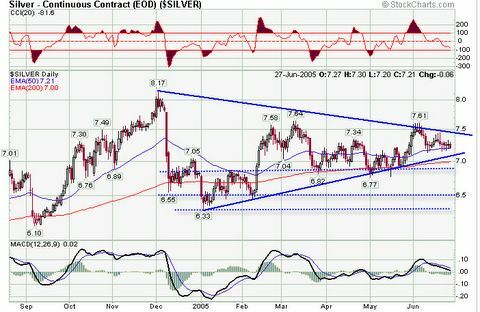 Here is a link to Gold and Silver COT positions. If the FED maintains a tightening bias this week, I would expect silver to break down out of that wedge given the typical July weakness. The pertinent question is "how far down?" 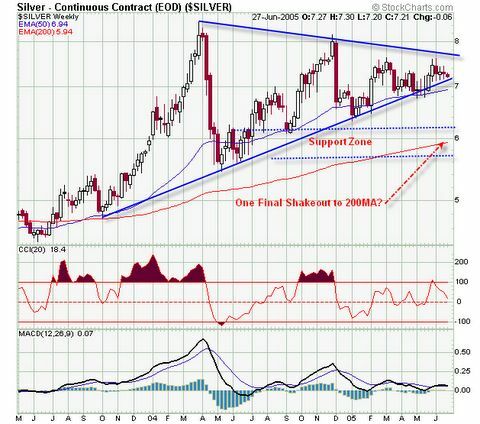 I wish I knew but a quick look at the chart will tell you that silver corrections are nasty and typically go much further than anyone expects. The safest (not necessarily the most profitable) way to play this is to stay on the sidelines or hold smaller core positions, expecting a seasonal break and letting the technicals then take care of themselves. 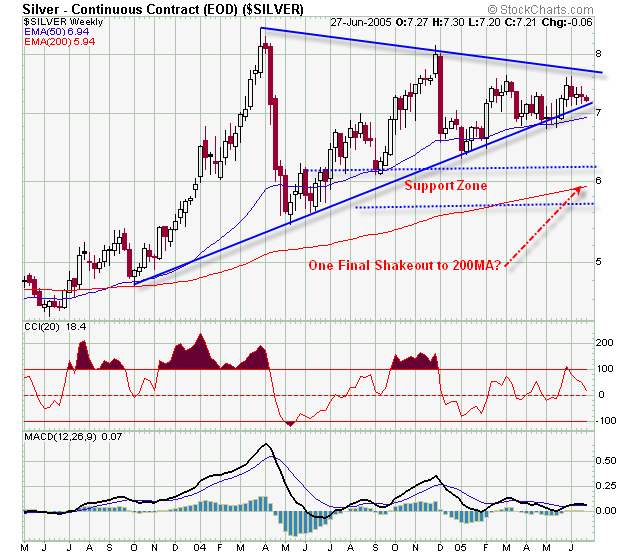 I am hard pressed thinking that silver falls all the way to the weekly 200MA, I am merely pointing out the possibility. If we get a pullback headed into late July I will be looking to buy either silver and/or gold for the autumn run. If the wedge breaks, and I think it will, there is a good possibility of a drop all the way to the 6.50-6.70 area. If that support breaks, and right now my feeling is that it will not break, we could see a drop to the weekly 200MA near 6.00. Ouch! The strategy of waiting for a break does run the risk of having the market get away from you, but now does not seem to be the best risk/reward to be over-leveraged in primary metals, either silver or gold. According to this article in the Boston Globe, Massachusetts foreclosures are up 28% this year even with home prices soaring. Let's take a look. "The spike in homeowners being taken to court for falling behind in their mortgage payments is one of the results of the 50 percent increase in Massachusetts home prices between 2000 and 2003 -- a bigger rise than in any other state. Across the country, mortgage debt is growing dramatically, according to Federal Reserve data. Americans took on $904 billion in mortgage debt last year, $276 billion more than two years ago." Is housing stretched to the limit and beyond? Sure seems that way to me. "When you tie all these factors together -- the bubble in the real estate market, the popularity of interest-only loans, the willingness of lenders to give loans without a significant down payment, the lowering of standards for lenders, and the deep desire of people to own something priced beyond their means -- you have a recipe for disaster," said Secretary of State William F. Galvin, whose office oversees the registries of deeds in a majority of the state's 14 counties. "That's what you're seeing in the Land Court." "Falling behind on mortgage payments is often precipitated by a layoff, divorce, or illness. But a new phenomenon is also at work: homebuyers who view the pile of equity in their house as a bank account to pay for credit cards, cars, college educations, or renovations. 'Serial refinancer' is the mortgage industry's term for people who refinance repeatedly, 'stripping' equity from their house." Jay Brinkmann, a Mortgage Bankers Association economist, said the rise in the number of mortgages entering foreclosure in Massachusetts is attributable to a lag in the recovery of the state's job market, compared with nationally. "We're not going to see a rebound until we get back to the jobs numbers we saw earlier in the decade," he said. Jeffrey Kitaeff, a bankruptcy attorney in North Andover, said foreclosure "is going to soar even more" next year because of ever-mounting credit card debt. Since 1990, the average household credit-card balance has more than tripled, to nearly $9,400. Kitaeff has many clients who have met their credit card payments by diverting funds from the mortgage. "A lot of people don't have any money. Their savings account amounts to two hundred bucks, and they're living week to week," Kitaeff said. The sad reality is that this "recovery" is already long in the tooth. Wages and job growth have not kept up with home prices. Something has to give and I suggest it will be home prices. Falling home prices will be a disaster to anyone and everyone dependant on "Serial Refinancing" to maintain their lifestyle. The day of reckoning is coming and coming soon. Warning bells rang three times while I was on vacation last week. Did you hear them? If not, here they are. 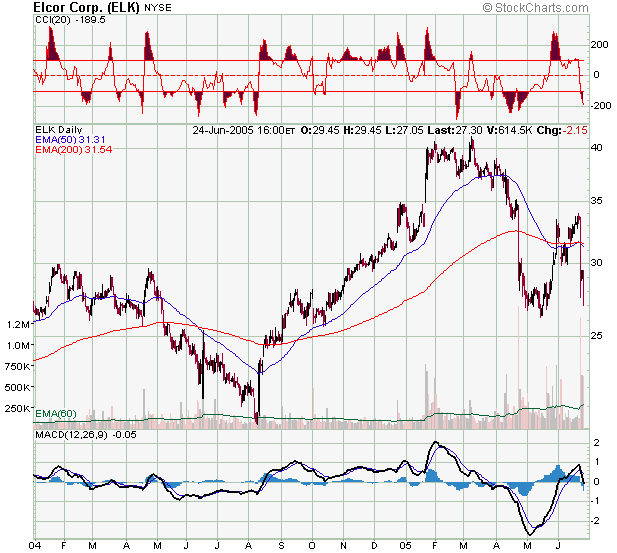 Sounding the alarm were Trex (TWP), ElkCorp (ELK), and A.O. 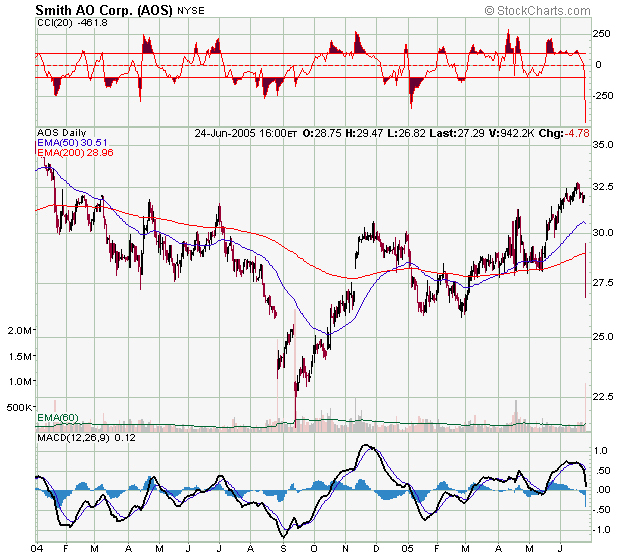 Smith (AOS), three suppliers to the homebuilder industry. All three warned last week. Let's take a look at each. Trex Company, Inc. engages in the manufacture and distribution of wood/plastic composite products primarily for residential and commercial decking and railing applications. It manufactures Trex Wood-Polymer lumber through a process that combines waste wood fibers and reclaimed polyethylene. The company provides three deckling lines, including Trex Origins, which features a smooth surface; Trex Accents that features a smooth surface on one side and an embossed wood grain on the other; and Trex Brasilia, which replicates the look of tropical hardwoods with color variations. Trex Company serves consumers, home builders, and contractors in the United States and Canada. Trex Co. shares plunged in aftermarket activity Wednesday after the maker of composite decking said it expects to post a loss in the second quarter and cut its profit outlook for the full year. The company blamed the earnings shortfall on higher-than-expected levels of retail inventory and adverse weather conditions. Trex also said sluggish expansion of its new distribution program with Home Depot Inc. caused sales to be less than expected. 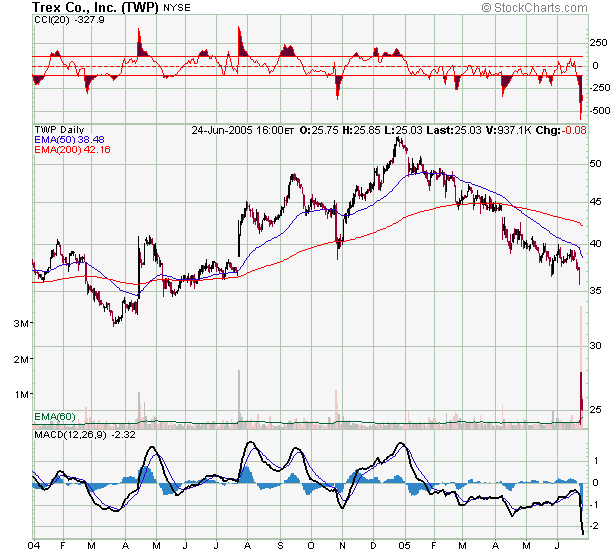 Trex forecast a second-quarter loss of 20 cents to 25 cents a share on sales of $75 million to $80 million. On average, analysts surveyed by Thomson Financial expect earnings of 90 cents per share on revenue of $100.9 million. In the year-ago period, the company earned 75 cents per share on revenue of $83.4 million. For 2005, Trex slashed its per-share profit outlook to 50 cents to 60 cents from its previous forecast of $2.16 to $2.23, issued in April. The company reduced its sales forecast to between $270 million and $280 million, from $300 million to $310 million. Wall Street projects earnings of $2.18 per share on revenue of $305.8 million. "We are taking a number of measures to curtail unneeded manufacturing capacity and to reduce expenses," said Chairman and Chief Executive Robert Matheny in a statement. Blaming poor sales on "adverse weather"? You've got to be kidding. Is that the same adverse weather that has home sales at record highs? Looks like to me someone was way overly optimistic about sales or perhaps this is a harbinger of new home sale plunges that will soon be forthcoming. ElkCorp, through its subsidiaries, primarily provides building products, including premium roofing products, performance nonwoven fabrics, and composite building products in the United States. Roofing products include laminated fiberglass asphalt shingles and accessory roofing products for steep slope applications. The roofing product line includes Prestique Gallery Collection, Prestique Plus High Definition, Prestique I High Definition, Prestique High Definition, Prestique Raised Profile, Capstone, Domain Winslow, and Prestique Grande High Definition. The company also offers starter-strip products, Seal-a-Ridge, Z Ridge, RidgeCrest, Elk Highpoint hip and ridge products, a built-in stainguard treatment, roof accessory paint, and other accessories. These products are sold by sales personnel primarily to roofing wholesale distributors in the United States. ElkCorp. on Wednesday lowered its fourth-quarter earnings forecast, citing challenges in the composite lumber business, higher than expected costs and lower than expected shingles volumes. The Dallas-based maker of roofing and building materials expects earnings per share from continuing operations to be 31 cents to 33 cents. Full-year earnings from continuing operations were dropped about 37 cents to a range of $2.09 to $2.11 a share from the previous forecast of $2.46 to $2.49 a share. Hmmmm....Lower than expected shingles volumes. New home sales at record levels but we have lower than expected shingle sales. Once again this begs the question: Was ELK absurdly optimistic above and beyond record home sales or is this a harbinger of new home sale plunges that will soon be forthcoming? 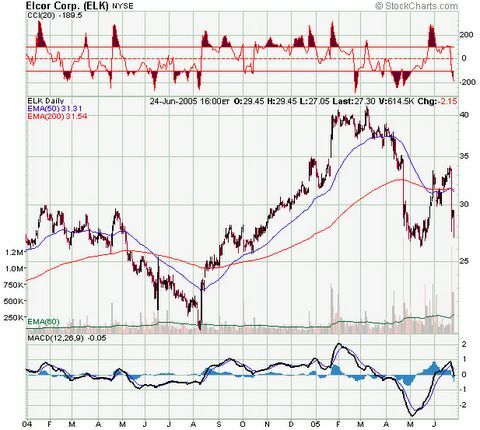 Here is a chart of ELK. A. O. Smith Corporation manufactures electric motors and water heating equipment for residential, commercial, and industrial end markets principally in the United States. It operates in two segments, Electrical Products and Water Systems. Electrical Products segment manufactures and markets a line of hermetic motors, fractional horsepower alternating current (AC) and direct current (DC) motors, and integral horsepower motors. Water Systems segment manufactures and markets residential gas and electric water heaters, standard and specialty commercial water heating equipment, copper-tube boilers, and water systems tanks. A. O. Smith Corporation’s motors are used in a range of targeted residential, commercial, and industrial applications, including hermetic motors that are sold worldwide to manufacturers of air conditioning and commercial refrigeration compressors; fractional horsepower fan motors used in furnaces, air conditioners, and blowers; fractional horsepower motors for pumps for home water systems, swimming pools, hot tubs, and spas; fractional horsepower motors used in other consumer products; and integral horsepower AC and DC motors for industrial and commercial applications. Once again I have to ask the same question: Was AOS overly optimistic about water heater sales or is there a serious housing slowdown looming? Do they or do they not put water heaters and air conditioners in new homes? At least AOS is not blaming the weather. I think it could be possible to ignore one bell as an outlier, but three bells from three different component suppliers is another thing. If that is not enough evidence for you then please consider this taunt by Larry Kudlow "The Housing Bears Are Wrong Again"
Kudlow made one of the worst calls in history when he told investors to buy tech stocks in March 2000. Can his beat taunt time the exact top of the Real Estate market too? That would indeed be an impressive record. Then again Kudlow will be likely be bullish from now till doomsday so perhaps we need to look further. Mish, Is there any other evidence? It just so happens there is. Let's take a look at the latest housing numbers in Massachusetts. According to the Boston Herald Massachusetts home sales plunge 11.1 percent. "About 4,142 single-family homes sold last month, down 11.1 percent compared to the same period last year. It was the second straight month in which the number of year-over-year home sales declined in the Bay State, the Massachusetts Association of Realtors reported. The decline was the sharpest since August 2002, when sales drooped 14.1 percent in year-to-year comparisons. Prices of both homes and condominiums continued to rise last month - by 6.2 percent for single-family dwellings and 4.7 percent for condos. The average price for a home was $359,900 in Massachusetts, while condos were going for a red-hot average of $279,900, an all-time record." Note the pattern that often ends housing bull markets. Rising prices on falling volume, as fewer and fewer people have the assets or conviction to carry the market higher. Indeed the supply of Massachusetts homes has increased to 36,259 which is about 8.8 months at the current sales pace. If history plays out, this figure is going to soar, prices are going to drop or both. One shoe dropped in Las Vegas last fall with Pulte slashing prices, Massachusetts is likely the second shoe, and we have three additional warning bells from building suppliers that all is not as rosy as it seems. Housing and the economy are both headed for a serious tumble as a nasty deflationary recession is headed our way. Book it. Why are interest rates low? Here is an interesting article by Bud Conrad on why interest rates are low. His assertion is that "Interest rates are low because of newly created money". "The problem of an expanding credit bubble is that it results in prices rises in a series of asset bubbles like housing now and commodity prices like oil. These are the specific signs of pockets of price inflation that is the result of the money creation. The loss in purchasing power of the dollar, especially internationally, is also a symptom of this credit expansion. The wider understanding of this debasing of the currency will lead to higher interest rates as investors demand higher returns to cover the price inflation. The irony of the short-term fix for lower interest rates by creating credit, is that the seeds of future inflation will grow into the reverse with higher inflation, higher interest rates and slowing asset prices." The preceding paragraph is true as it reflects what HAS happened (especially in regards to housing), but it does not address the more important question which is "where to from here". I am of the belief that Greenspan's conundrum will be resolved at exactly the worst time for Greenspan. In other words, I expect a spike in interest rates the moment he pauses, and perhaps again the moment he first cuts rates. That will be it. I do not know if that will be with the 10-yr yield rallying from 4.0% to 4.6% or from 3.75% to 4.25% or whatever. I think it will be short lived but it will likely spell the final death to housing. From where we are today however, that is hardly any movement in rates. Bud does say "We have not had a credit bubble burst as did Japan after 1989 or the US after 1929, but on the contrary we have had an expanding credit bubble." To which I reply "Exactly"! We have not yet had our bust. When we do, why should the expectation be any different that what happened in Japan? That is: a crushing blow to housing prices, falling stock prices, falling demand for credit and falling interest rates. When the demand for credit drops, interest rates will follow. The spike I refer to above will be the last gasp of those in the inflation camp to say "lookie here" and one final chance for treasury bulls to get shaken out of the march to all time low yields when the demand for credit shrinks to new lows. Thanks for the article and graphs Bud, it was very well put together (and anyone who knows me knows I would not say that unless I meant it). That said, housing and inflation are the past and not the future. 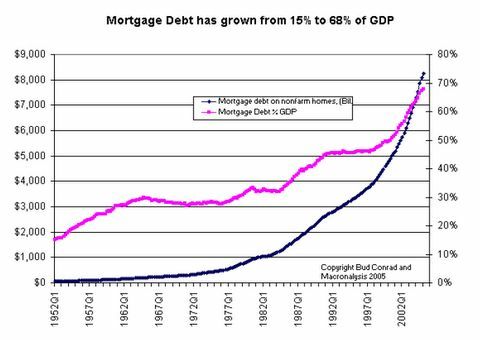 I think a parabolic mortgage debt chart, covers of two leading magazines espousing housing, and rampant speculation in California and Florida are proof enough. Note: I may get one more post in later this evening. Otherwise I will likely be gone for about a week. MIAMI--(BUSINESS WIRE)--June 14, 2005--The nation's first offshore around-the-clock mortgage processing service has been announced by E-OPS. The service is conducted in a paperless fashion, with originators either faxing, uploading or entering data into the E-OPS web-based system and offshore processors handling all processing tasks required prior to closing. E-OPS is the world's first around-the-clock offshore paperless mortgage processing service. A revolutionary service, it empowers brokers and loan officers to close loans more quickly, with less hassle, and at a lower cost. The vision of mortgage industry veterans, E-OPS represents a leap forward for loan processing. E-OPS is based in Miami, Florida, and can be visited online at www.EOPS.cc. I am sure that is exactly what we needed. Why should any housing related jobs stay in the US anyway? Now if someone could only figure out a way to offshore home construction, I'm sure our economy could really fly. BTW, I will be out most of next week. So there may not be any more blogs for a week or so. Perhaps I get another one out later today or tomorrow. I think I have a couple of articles coming out in Whiskey and Gunpowder sometime next week. Timing is unknown. Those interested can subscribe to Whiskey and Gunpowder here. There is no cost to subscribe. Check out the following sentimental logic. "This will be a good year in the market. It may not be a great year, but it'll be a good year. Greenspan isn't going to let this fall apart," said Michael Murphy, managing partner at the Piney Run Group in Baltimore. "There's just so much respect for him, no one questions him. He's the guy who moves the market. My concern is going to be for next year, when they try to replace him. You know how the market hates uncertainty." Rudi Dornbusch, a prominent MIT economic professor proclaimed in the Wall Street Journal "This expansion will run forever". The U.S. economy will likely not see a recession for years to come. Because, Dornbusch asserts, and I'm not making this up: "We don't want one, we don't need one, and, as we have the tools to keep the current expansion going, we won't have one." One question Mr. Michael Murphy, did Greenspan prevent the recession in 2001 that Rudi Dornbush thought impossible? Gee, what happened to the silly logic that we will not have a recession simply because "We don't want one"? Flash forward 2005.... This will be a good year because "There's so much respect for Greenspan" and unlike 2001, "He will not let this fall apart". It's clear from this that the same factors that threaten to pop the U.S. real estate bubble would also pop a worldwide real estate bubble. Like the popping of Japan's real estate bubble in 1990, this could lead to long-term recession. I believe that the world's central banks would flood the world with liquidity, to prevent this from happening. Both Japan and China have already done this, with the central banks "creating" hundreds of billions of dollars worth of their own currencies, which they used to buy U.S. Treasuries. This is a major reason that I believe that the economic problem of the future will be inflation, not recession. Can you please define the ending point in your cycle? Does the cycle end when everyone has 3 houses and no renters? 20 houses and no renters? Can the government print money from now until the end of time to forestall a recession? If it's so easy to prevent a recession by printing money, why do we ever have them? Is there no end to the demand for credit regardless of wage growth and outsourcing and loss of union and other jobs? Can Japan keep printing money and buying US treasuries until US treasury rates hit zero? What then? Can home prices keep climbing exponentially although wages do not support prices? How are people going to pay property taxes and medical expenses unless wages pick up? Is GM about to offer unions more money? Is outsourcing to India and China about to stop? Are telecom mergers slated to destroy 20,000 jobs this year going to reverse? Are bank mergers and other mergers that will destroy jobs going to stop? Is productivity going to fall off a cliff so that more workers will be needed tomorrow than are needed today? Are wages and employment going to rise as long as outsourcing, mergers, and productivity are increasing? Is the demand for housing infinite regardless of price? Is the willingness to supply credit for housing infinite regardless of price and regardless of the credit worthiness of borrowers? Can ANY inflationist out there please address all of those questions in a single coherent post and tell me how with falling wages and stagnant jobs the demand for money AND the willingness to lend it is infinite. Right now people are willing to borrow and banks are willing to lend on the foolish belief that housing prices can rise forever. We had the exact same belief about the stock market in 2000. The only logical way to believe in inflation is to believe that credit expansion and the willingness to lend it can go on forever in spite of falling wages and job losses to mergers and outsourcing. Wait a second. That's not logical at all. Then again, perhaps you think outsourcing will stop, GM will raise wages, airlines will become profitable, medical expense will drop, and property taxes will not increase with rising home prices. Hmmm that does not exactly seem very logical either. Is this a new paradigm such that logic and fundamentals will be meaningless from now until forever more? I have one final issue I would like inflationists to address: It would seem to me that hyperinflation would bail out debtors at the expense of banks and lenders. Are banks going to want to do that? If so, why? Wouldn't that make all of the mal-investments into property a smart thing to do? Does that seem likely or logical? OK would some inflationist out there please tie all of those questions together for me in a nice logical reply? I am getting tired of the short answer always offered to every deflationist argument: "The FED will not allow deflation and will print its way out of it". It is time for someone to step up to the plate and put some consistently logical reasons together addressing all 14 questions I laid out above and then go on and tackle the final nut to crack as to why banks would bring hyperinflation on themselves to bail out debtors at their expense. I have been asking these questions for months and still have not found a taker. "There has been much discussion recently about a housing bubble, but the truth is that home price appreciation has slowed considerably in the past three months. The time to talk about a bubble was last December". The week is not over yet but I am closing the polls early by awarding that comment the Weekly Gold Medal For Stupidity. "Bankers are being very diligent now about their lending practices," and the FDIC is "closely monitoring bankers' lending practices right now due to the long run in the housing boom. (The notion) of exotic products out there that are extremely dangerous is well overblown." Those and other beauties were compiled by my friend Calculated Risk. Click here to see his humorous take about the situation. According to Steve Kaer, a top-producing agent for Coldwell Banker/Barbara Sue Seal Properties, "If interest rates went up to 8 percent, we'd still have this kind of buying because people are here, and they want to live close to Portland". In the meantime fear not if you had worries about "everyone" believing there is a housing bubble. Not only does the public not see it, many experts in the industry are in denial as well. The U.S. economy is in "unexplored territory" making it difficult for the Fed to get a handle on the outlook, said Federal Reserve board governor Donald Kohn. "You need to keep in mind that our economy is in unexplored territory in many respects," Kohn said in a speech prepared for delivery to a banker's conference Wednesday in New York. Kohn said there are "some unusual imbalances" in the U.S. economy, pointing out that the U.S. current account deficit is in excess of 6% of GDP and household savings have fallen to about 1%. "We are buying far more than we produce, and the extra purchases come from importing more than we export, financed by net borrowing from abroad," Kohn said. At the same time, low long-term interest rates have driven up housing prices. Given this mix, Kohn said historic relationships of interest rates, exchange rates and house prices "may not be very good guides to future relationships." All in all, "the risk of rapid adjustments and unusual configurations of asset price movements is higher than normal," Kohn concluded. "I expect that the adjustment to more-sustainable patterns of spending and production and saving will occur in an orderly manner," Kohn said. "The fundamentals, such as growth and inflation expectations and underlying financial conditions, appear to support continued good economic conditions," he said. The Fed's continued focus on price stability and high unemployment "should help damp the economic fallout from unexpected developments," Kohn said. This will be resolved in an orderly manner? That's news. Since when are 20 year excesses, insane credit creation, loose lending standards, and mammoth bubbles everywhere you look resolved in an "orderly manner"? As for "good economic conditions" I violently disagree. We have horrid economic conditions. They only appear good and will continue to appear good only so long as the credit bubble keeps expanding. With housing and consumer spending constituting at least 2/3 of the economy, the "good conditions" will last only until the credit bubble supporting 0% loans for flipping insanely overvalued properties on both coasts as well as many major cities, collapses. Finally, Kohn's assertion that the FED can simultaneously focus on both price stability and employment is ridiculous. It is hard enough to control one variable with economic policy. It is impossible to control two. Are these guys really that clueless or are they just saying things to prevent panic? For all the enormous stimulus that was supplied: 1% Fed Funds rate, business tax credits, war stimulus, dividend reductions, tax cuts, election year stimulus, loose lending standards, cash out refis, etc etc etc, this economy produced zero private sector jobs under Bush. Now, with some of that stimulus being taken away, Kohn thinks we can have price stability and create jobs too. In case you missed it, click here to see more silly comments by the FED and others. BTW, the reason we are in "unexplored territory" is because of all the bubble management techniques and lack thereof by the FED. I am quite confident that once the housing bubble pops, the FED will once again be chasing its own tail. What happens when "Exceptional Conditions" become the norm? I am sure that question is on the minds of European readers tuned into the Mish Blog. Let's take a look. On June 6th it was announced that, Italy and Portugal Face the Wrath of the EU over their deficits. Italy is supposedly in a "soft recession". Will that condition become exceptional if it turns into a "hard recession"? To the ire of Italian officials, the European Commission agreed to launch disciplinary action against Italy for flouting EU budget rules. EC Officials also announced possible action against Portugal. The EC went on to say "The excess of the deficit over the reference value is not exceptional, as defined by the Pact ... nor is it the result of a severe economic downturn," conditions which may have won Rome a reprieve, the commission said in a report. Enquiring Mish readers want to know if there is a clear cut definition of "exceptional" as well as clear cut timeframe in which exceptions MUST be addressed. I am not perfectly in tune with EC rules so if someone has precise rules and timeframes please Email them to me or simply post a response. Here is the key question: How long can Germany play the "Reunification Card" as "exceptional conditions"? From now until doomsday? I mean really, how long can an exception last before it becomes the rule rather than the exception? What about France? What's its excuse? Is France undergoing reunification? Is France undergoing a shortage of brie? I admit the latter would be a total and complete travesty of justice but to the best of my knowledge, there is no brie shortage in France. How long can a country with no perceptible "exceptional conditions" get away with playing the "exceptional conditions" card? I have no doubt now that Portugal will somehow be claiming "exceptional conditions" quite soon. I can't wait to hear the excuse. Is Italy even telling the truth about how bad it will miss EU stability pact agreements? Let's take a look. Last year the Italian government reported a deficit of three percent of GDP, just meeting the EU limit. But Eurostat, the EU's statistics arm, has refused to validate that figure. Brussels has forecast a budget deficit of 3.6 percent of GDP for Italy this year and widening to 4.6 percent in 2006. Italian Finance Minister Domenico Siniscalco admitted on Tuesday that the deficit would exceed the EU's limit in 2005, remaining "under four percent". Is there any reason to believe the Italian government over Eurostat? Somehow I doubt it. At any rate, someone please check my math: Is 4% under 3% or not? Meanwhile, some people are worried about the spread of SARS or the Bird Flu Virus. The real question to be answered is this: Is anyone paying attention to the rampant spread of "exceptional conditions"? Whatever strain of virus it is, it seems to be impervious to anti-viral efforts. Take a look a Germany. Wow! If the US ever catches that strain of the ECV (Exceptional Conditional Virus) we are in trouble. Then again perhaps the US has better news suppression techniques than the EU. I wonder if we already have that disease but it has been purposely misdiagnosed as "The Greenspan Conundrum". Has the US center for disease control been alerted to this possibility? Back in the EC, it sure seems that the biggest inflation hawks are now showing "mild symptoms" of ECV. I offer this as proof: "ECB Chief Economist Otmar Issing said on Monday a cut could not be ruled out, and Trichet himself, apparently inadvertently, fanned speculation by telling a banking forum in Beijing earlier on Tuesday the ECB would do all it can to bolster confidence." Quite frankly that is startling. Indeed, a quick look at Euribor futures (Interest rate futures in the EU) show them flat as a pancake for the next year. Given the time value of interest rate futures, that affectively means a rate CUT is now priced in. Back on April 7, Jean-Claude Trichet said that "Rate cuts are not an option at the moment". "Looking further ahead, the conditions remained in place for moderate economic growth to continue, Trichet insisted. Global growth remained solid, 'providing a favourable environment for euro area exports,' he continued." Favorable environment for Euro exports? What about EU jobs? What is he smoking anyway? Let me translate the text of this speech for you in terms that everyone can understand. Here is the Mish interpretation of what Trichet REALLY wanted to say: "Conditions in the EU are bad. They will remain bad. We do not really see a catalyst for growth in the EU until long after Germany and France change their labor rules and we really do not see that happening anytime soon. In the meantime and even AFTER reform, unemployment in Germany and France will rise. No pain, no gain. If a rate cut would stimulate sustainable economic growth, we would be happy to do it. As it is, rate cuts will do nothing but propel us deeper into the deflationary death trap that Japan went through. In short, cutting rates would just fuel bubbles in housing, exactly as the FED has done, but it will not do anything for lasting growth. Things will get a lot worse before they get any better but at least we are not lying to you as Greenspan is doing in the US." There, wasn't that 100% understandable? The problem is that anyone who tells the truth would be fired or not reelected. People want to hear lies even when those lies do nothing but make problems worse. However, it now is readily clear that Issing and to a lesser extent Trichet, have both caught ECV. In light of that fact, I now confidently predict that the EU will soon be on the way to ZIRP (Zero Interest Rate Policy) next up after Japan. The nature of the ZIRP game is such that the last one to hit zero, wins. Are stock prices going to remain range bound forever? That seems to be what the standard measures of volatility are saying. In spite of all time lows in volatility on the NASDAQ 100 index ($VXN), and extremely complacent volatility measures on the SPX ($VIX), volatility selling hedge funds are selling options aggressively striving for yield. $10 billion has come into mutual funds selling options as a source of income. With volatilities this low, does it make sense to sell options for yield or is it better to buy them? Let's take a look at a few charts and see what we can see. Here is a chart showing the new all time low on NASDAQ 100 volatility. Just a hunch, but I have a strong feeling that sometime soon 20 will become support on the $VXN as opposed to resistance. Here is a chart of the NASDAQ 100 index itself. Notice that we are setting new lows of volatility in spite of significantly lower stock prices. Can this situation last? Of course not. Then again, it can probably last long enough to ensure that the maximum number of people is totally dependant on the relationship holding. Are we there yet? If not, I think we are close. 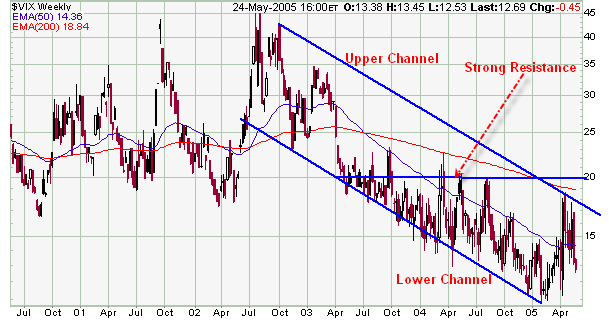 Here is a chart of the $VIX, the S&P 500 volatility index. Once again I have a strong feeling that sometime soon 20 will become support on the $VIX as opposed to resistance. a chart of treasury yields vs. the Moody’s baa junk bond index. Of all the above charts, I think the last one is the one to focus on. Here is where to watch it. If corporate spreads widen, stocks will likely head down, possibly with a small lag. Complacency has been rampant in the corporate bond world. Companies, even junk rated companies have been repeatedly able to get financing, not for expansion but also for stock buy back efforts in blatant attempts to force share prices higher regardless of value. Of course corporate insiders have been bailing into these buybacks. Other companies have been taking on debt for mergers at absurd prices. Some of this came to an end with the blowup of General Motors (GM). How stock prices act in the future are likely going to depend on the sanity (or insanity) of corporate bond investor’s willingness to go along with the nonsense we have seen to date. Thus the chart to watch is the last one. If corporate bond spreads widen, stock prices are likely to decline. Equity prices may decline anyway based on sheer nonsensical valuations and expected earnings growth, but should bond investor's appetite for risk shift direction, stock prices are almost guaranteed to follow suit. With that thought in mind. Let's take a look at some of the underlying components likely to affect equity prices. Those buying corporate bonds have one primary concern in mind: that the company will not default. The further out in duration and the lower in credit rating of the company, the greater the risk of default and thus the higher the yield demanded by bond investors for the risk. The difference between a corporate bond yield and a treasury yield of similar duration is the yield spread. Yield spreads fluctuate with investor sentiment, narrowing when investors grow more confident about a corporation's long term prospects, and widening when investors start showing signs of concern. When corporate bond spreads widen, equity prices typically decline. The reverse is also true, when yield spreads narrow, equity prices tend to remain firm. Yields spreads are now near historic lows. Default risk as measured by complacency seems to be almost nonexistent even though the economy is clearly slowing, leading indicators are pointed lower, foreclosures are on the rise, and the lending standards for mortgages is in the gutter. It remains to be seen how the multitude of hedge funds in the corporate bond carry trade can extradite themselves for this precarious situation. 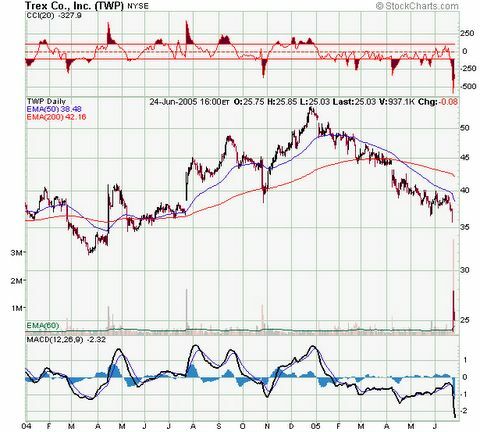 The downgrade of Worldcom to junk status was one of the major problems in 2002 that sent the equity markets tumbling. Perhaps GM will ultimately have the same affect. A Credit Default Swap is a bet between two parties on whether or not a company will default on its bonds. A CDS investor is therefore making essentially the bet as the corporate bond investor. The difference being the counterparty is not a company issuing bonds but a third party willing to speculate on the outcome. Credit Default Swaps are often used in lieu of corporate bonds when a fund manager can not find enough bonds of the right duration for a company in which they want to invest. In that case, if a hedge fund or other party wants to make a bet as to whether or not a particular company will default, all it has to do is find a suitable counterparty such as another hedge fund, a broker/dealer, or an insurance company, etc. to take the other side of the trade. In a typical CDS, the parties agree to swap cash flows so that one party gets a large payoff if the company defaults within a set period of time, while the counterparty gets periodic payments as long as the company does not default. In theory, CDSs should trade in tandem with corporate bonds. Then again, there is theory and there is practice. One reason they may not trade in tandem is due to the fact that CDS trades are party-to-party deals that are by their very nature extremely illiquid. Furthermore, because of this party-to-party relationship, it is not really possible to get an accurate handle on their size. Wall Street estimates put the CDS market at $5 trillion and the International Swaps and Derivatives Association has a global estimate of the CDS market at $8 trillion. Since the investment grade bond market is a mere $2 trillion and the Junk bond market just over $1/2 trillion, you can easily get a sense as to how carried away "investors" have gotten with CDS plays. In this writer’s opinion, the CDS market is an accident waiting to happen, and I predict that accident will come. At any rate, given the size of the CDS market compared to size of the corporate bond market, is it any wonder that hedge funds were having "difficulties" when the price of GM stock went one way and GM bonds another? A CMO is a group of mortgages with varying profiles, bundled together and then sliced into smaller pieces according to risk. The overall risk of the package is the sum of all the mortgages in it, but the profile of each slice can range from very safe to very risky. Investors can take on a less-leveraged exposure to the mortgage market by buying a safer slice or an investor can seek higher yields by buying a riskier slice. CDOs work on the same principle of CMOs except that bonds or loans are put into the package instead of mortgages. CDOs are backed by actual bonds or loans but synthetic CDOs are backed by even more complex "bond-like" structures that build leverage on top of leverage in what some critics might call imaginary structures. CDOs and synthetic CDOs are among the most complex financial instruments that you can find. They are often cut into custom tailored slices to suit the "needs" of an individual hedge fund. Obviously this complexity makes the CDO market very illiquid. Illiquid CDOs may contain illiquid CDSs as part of the structure. Given the party-to-party illiquidity of both the CDS and CDO markets with one potentially "supporting" another, it is obvious we have an enormous problem should anything go awry. Synthetic CDOs have become hugely popular because they offer almost infinite ways for banks, insurers, hedge funds, and many other money managers to speculate on credit spreads-the spreads between different debt markets, between the debt of different issuers, between different classes of debt on a single company's balance sheet, and so on. Other innovations include swaps on first-to-default and nth-to-default baskets, swaps on credit derivative indexes, and other highly complex swaps that attempt to cover more than just default risks by combining amortization, call, and prepayment provisions into a single package. There are also total-return swaps, which bundle a swap with its underlying debt security, and combination notes, which package pieces of CDOs to create a new security. Investors can also purchase over-the-counter credit options, and the Chicago Board of Trade and the Chicago Mercantile Exchange are both considering launching credit futures contracts. Gee, just what we need. How could we possibly have gotten by without that? Some CDO portfolios are combining credit swaps on bonds and loans, and others are branching into swaps on asset-backed securities backed by anything and everything from commercial and residential mortgages to aircraft leases. Rating agencies have been hard pressed to keep up with all the new wrinkles. Given the "obvious benefits" of these "investments", CDOs and synthetic CDOs have sparked a boom in "credit risk transfer" as hedge funds and banks are all trying to measure and capture anomalies in the spreads between various credit instruments. Let's flashback to 1998. Attempts to exploit anomalies in credit spreads is essentially what Long-Term Capital Management (LTCM) was trying to do when it collapsed in 1998 and nearly threw the U.S. financial system into a freefall. Lenders organized by FED, just minutes before an options expirations close, bailed the fund out. The FED has always stood ready to "bail out" the most stupid investments and that of course has led to even more widespread taking of risk such as we are currently witnessing. Of course CDO activity is far more "sophisticated" today than when LTCM blew up. Whether that is reducing the risks or creating huge new perils is a subject of much debate. Perhaps I mean the subject is debatable until some six sigma event blows it all up. Here is something to ponder in the meantime: Given the literal explosion in the use of CDOs and CDSs what will happen if something causes credit spreads suddenly to widen far more than risk models anticipate or anyone expects? I suggest the answer will not be pretty to say the least. In that regard, I sense a lull before "the big storm" and that big storm will hit in the form of a housing bust, a junk bond blowup led by GM or Ford, trade wars with China, or something completely off everyone's radar including mine. There are indeed numerous potential "tipping points" and any of them could send us over the edge. Looking back at the Russian crisis in 1998, the default occurred in August but the credit market did not feel the full effects until October. On that basis the true consequences of mark-to-market losses from General Motors and Ford debt downgrades as well as future demand for more corporate junk may take a few months to become apparent. Perhaps the best chart to watch for signs of pending volatility trouble is the Moody's baa to treasury chart. I believe it will eventually reverse and spreads will dramatically widen. How fast that happens will determine the speed and magnitude of any potential problem. On the other hand, should the market decide that GM is not a problem (and nothing else bad happens either), perhaps we have one last insane blast up to new highs. In either case, those selling volatility for a pittance of extra yield at these complacent levels are forewarned. Note: The following article was originally published in Whiskey & Gunpowder on June 9th. Quite literally this was an amazing week for stupid comments by Fed officials, the California Building Industry Association, former FED officials, spokesmen for the US army, spokesmen for banks, and investment clubs appearing on CNBC. In aggregate it was a totally stunning and possibly unprecedented performance. Let's take a peek. I will start off with one comment that is so blatantly stupid that it was instantaneously perceived as being completely stupid by practically everyone. I intended to do a blog on this one item alone but by the time I passed the comment around, three other blogs were already reporting on in. In case you missed it however, here it is: Federal Reserve Bank of Dallas President Richard Fisher said to CNBC TV on Wednesday "Where would the world be if Americans did not live out their proclivity to consume everything that looks good, feels good, sounds good, tastes good? We provide a service for the rest of the world. If we were running a current account surplus or trade surplus, what would happen to economic growth worldwide and what would be the economic consequences? So I think we are doing our duty there". Wow, that is stunning! We provide a service to the world by consuming everything that "looks good, feels good, sounds good, and tastes good". Damn. That is quite a "service", and to get paid for it too. It's a tough job and since no one else wants it, I guess the US will just have to bear the sacrifice and pay it alone. Let's now take a look at what Mr. Alan Nevin, chief economist for the California Building Industry Association had to say this week: "People have the ability to borrow against their homes. 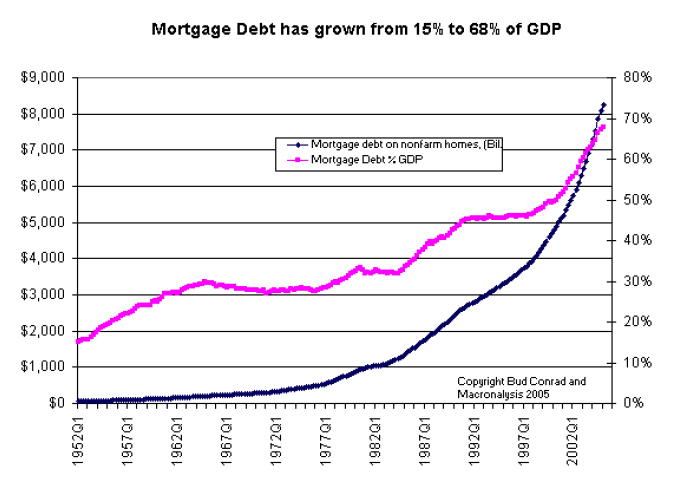 If times get tougher, they could borrow a sufficient amount to pay their mortgages." Wow. Another startling revelation! Borrow money to pay your mortgage. Gee who woulda thunk that? Obviously many, given the cash out refis we have seen lately. In any other week the above comment would easily win hands down as the stupid comment of the week but unfortunately this was not any ordinary week. Mr. Alan Nevin had to compete and lose to Mr. Fisher. Such are the unpleasantries in life. This is kind of like losing to Tiger Woods on that incredible pitch shot in the Masters. Perhaps Mr. Nevin will be given another chance at the gold at a later date. On second thought, the perpetual motion device he is describing is just so absurd that I am going to proclaim a tie and award both Mr. Fisher and Mr. Alan Nevin gold medals for stupidity. Does anyone object? Jumping on the stupidity bandwagon, the US Army blamed parents for recruitment problems. "Parents," said one recruiter in Ohio who insisted on anonymity because the Army ordered all recruiters not to talk to reporters, "are the biggest hurdle we face." Amazing. Rumsfeld looks silly everytime he opens his mouth and the lastest is no different. Here is Rumsfeld's latest rant about China: "Since no nation threatens China, one must wonder: Why this growing investment? Why these continuing large and expanding arms purchases? Why these continuing robust deployments?". Note that this is coming from a nation that is spending more on "defense" than most of the rest of the world combined. Perhaps China fears us or perhaps China is attempting to spend the US into the ground like we did to Russia. Then again, perhaps Rumsfeld is just clueless. BTW, isn't Rumsfeld supportive of weapons in space? Hmmm. Is Mars planning to invade the US sometime soon? A poster on the Motley Fool had this bit of wisdom to offer the world: "The only reason anybody on Earth talks about "evil America" is because it echoes the theme song of the press and the hysterical Democrat left." I offered a free shot to that person at taking it back but he repeated his comment to me in bold. Yes, readers this is yet another startling revelation. It is quite staggering the power the "hysterical Democrat left" has over world politics. Aparently this poster truly believes that US Democrats can control the attitudes of the entire world yet they can't even win an election in the US. Amazing. OK enough of politics. Let's get back to the economy. Mish, what are they saying about the yield curve? OK, that is a good question so I am glad you asked. I have no fewer that three select comments to offer: Here is the first: "It really depends on when you get the flat curve," said Mark Vitner of Wachovia Securities. "Right now with the low rates, I don't see dire implications from a flattening yield curve." Wow. The knowledge imparted this week is simply staggering. Here is the implication: "It's Different this time". That's a relief. I was sure starting to get worried about that flattening of the yield curve. I am relieved to know that it does not matter since interest rates are low. Mr. Vitner's view was echoed by Bernard Baumohl, executive director of the Economic Outlook Group of Princeton, N.J. He said when the spread between long and short rates narrows but both remain below 4 percent it's "just not problematic for an economy with a low underlying rate of inflation and still healthy productivity growth. There's still plenty of liquidity out there and the cost of capital remains relatively cheap." Not to be outdone on the implications of the yield curve flattening was former Fed Governor Laurence Meyer who offered this advice: "Be careful how you interpret a very narrow curve or even an inverted curve in the context of structural forces that may have flattened it," said former Fed Governor Laurence Meyer. "It doesn't mean the same thing that it used to mean." If you were not relieved by the comments of Mr. Vitner or Mr. Baumohl, I am positive you feel better now. We have no fewer than three confirmations that when it comes to the yield curve that "It's different this time". I do not know about you but I will sure be sleeping easier this weekend since "Things don't mean what they used to mean". Even though we are now headed into Summer, I just caught a bad case of case of Spring Fever. Baseball is on my mind. The question I am most concerned with is this: What Inning Is It? Now if you are a baseball fan, and perhaps even if you are not, you just might be wondering the same thing. In that regard I am pleased to provide a set of opinions that will suit practically everyone. Federal Reserve Bank of Dallas President Richard Fisher told CNBC TV on Wednesday, "I think we've room to tighten a little bit further," Fisher said, but, using a baseball analogy, added that the U.S. central bank is in the eighth inning of its tightening cycle and entering the ninth, and usually final, inning this month. On the other hand Federal Reserve Governor Edward Gramlich when asked about what inning we were in had this to say: "I don't know what inning we're in, period." Now what kind of wimpy opinion is that? Then again, Drew Matus, economist at Lehman Brothers had this to offer: It is "still the sixth inning in our view as we do not expect this one number will impact the Fed's thought process". Fed Governor Susan Bies was clearly confused about what inning it is when she offered this statement: "At some point we do believe that the 10-year Treasury (note yield) will rise". Now that's commitment for you. I am 100% sure she is correct. It might be today or tomorrow or 20 years from now but I am sure the conundrum on low interest rates will eventually be resolved and that rates will rise. I am distraught however, that she did not offer an opinion as to what inning we are in. Meanwhile I am very pleased to report that Fed Governor Stern is unfazed by relaxed credit standards. Like Susan Bies, he did not seem concerned about what inning this is. Here are his thoughts: Shifting trends in home mortgages and the increased use of adjustable-rate terms are not a huge risk to banks, Gary Stern, President of the Minneapolis Federal Reserve, said on Thursday. "It sounded to me like credit standards have been relaxed. Some people expressed concern then and continue to express concern. There's some smoke there, but is there a fire? Not yet, anyway," Stern said. Would you want your life in his hands if you were in a building billowing out huge clouds of smoke. What's the moral of this story anyway? Don't worry about smoke until fire is burning your house down? Is there more? Yes of course. It seems that Mr. Fisher said we might go into Extra Innings if necessary. Wow. That's a relief! Could the April job numbers possibly have been more horrid? I was stuck in gloomy woe on those numbers, saying woe woe woe, until I saw this analysis from Wachovia's chief economist John Silvia who had this bit of wisdom to offer: "Wages and unit labor costs rising and unemployment rates falling suggests we are running out of workers." Wow. We are running out of workers. That is staggering. I think this is a national disaster. Then again, if we are running out of workers why are we threatening China with 27.5% tariffs on grounds that they are stealing all of our jobs? OK Mr. Silvia I now have the dreaded CD (Conundrum Disease) on top of Spring Fever. This could be serious. Here is my question: How can China be stealing our jobs when we are running out of workers to fill them? Then again, that comment seems so blatantly stupid I must award it the silver medal. CNBC was quite interesting on Friday. I hope everyone had a chance to catch the pearls of wisdom from a real estate investment club in LA in which members shared their investment strategies reminiscent of the stock euphoria of 2000. Said one club member "I am using negative amortization loans, and yes it adds $10 thousand to my loan, but the properties are appreciating $100-150 thousand." Another comment was "I quit my job that I had for thirty years and I am investing in real estate full-time. I am not just investing, I am investing smart." Gee, after a 20 year run up in housing prices that have gone parabolic in the last couple years, I am sure relieved to know that he is "investing smart". I have another question: Does negative amortization with leverage sound remotely like margin? Federal Governor Gramlich reported today that nirvana was reached . Yes, I am sure you understand the implications, but if not I offer the following snips: "I would argue that we have achieved price stability," Gramlich said in answer to audience questions after a speech to a group of real estate editors. "To me, that is the ultimate test of price stability -- do you think that $10,000 goes farther this year than it did five years ago? I would argue in that sense we have achieved price stability. I would further tell you that we mean to keep at it, that other aspects of the economy don't suffer when we stabilize prices in this sense, and that's what we're going to do." Mr. Mogambo, I have been looking for signs of "price stability" nirvana for quite some time. Unfortunately I have not found any. Since nirvana has now been reached, however, I am quite sure that a person of your stature can find some. Could you please run down your list of items and report to the kind readers of the Daily Reckoning your findings on "price stability" now that we have reached nirvana? Here is my take: Even though we have reached nirvana, there sure seems to be an awful lot of conundrums running rampant. I would think that once nirvana was reached that conundrums would have long been resolved. Furthermore, it seems strange that even the FED does not know what inning we are in even though price stability has been reached. Could it be that the game being played is really football, not baseball? If so, perhaps the relevant question is not what inning we are in, but what quarter we are in and how much time is still left on the clock before this all blows up. It’s hard to say if this is a real story or not but I am quite sure that this kind of situation is happening all over the place. Check out this story and be sure to click on the link to see the replies as well. Help! Any ideas, comments welcome. My partner and I are in a mess with a brand new house in Las Vegas. Here are the details. 1. AUG 2004, we paid $445,000 for a Pulte model in the community of Aliante, North Las Vegas. 2. 100% financed and still owe roughly the same. 3. Currently could only sell for about $360,000. 4. Finally found tenants to lease out for $1100/month in APR to reduce neg cash flow to $1900/month. We are running out of cash quickly. We desperately need some ideas on how to get out of this house immediately. I think that story is going to be repeated thousands of times in Florida, California, and in fact all of the bubble areas within a year or less. According to Jack McCabe, CEO of McCabe Research and Consulting "Short-term speculators flooding the condo market in Southeast Florida have created a tidal wave of investor enthusiasm that will most assuredly lead to oversupply and downward pressure on pricing within the next few years. Publicly you won’t find a developer or a lender who tells you that they’re concerned about the market at this point. Privately, they will all tell you that they are concerned. One lender has already cut off funding for condo construction." A single lender cutting off funding now is too little to late if you ask me. The damage has already been done. It's just that no one sees it yet. Does anyone recall some of the bizarre theories circulating around in spring of 2000? When things started declining I remember hearing "They are just trying to steal your shares", and "They missed the big runup in JDSU and are pushing it down so they can get in". The counter-argument circulated in the chat rooms was "don't fall for it, the 'gorilla' is worth any price, just hang on". I am sure there were plenty of other conspiracy theories floating around and thinking back on it now, if there was a Wall Street conspiracy at all it was to get you to hang on and stay the course even though Henry Blodget, Mary Meeker, and others knew the stocks they were touting were worthless. I am not much of a conspiracy buff but if in fact there was a conspiracy, people were 180 degrees wrong about just what it was. JDSU fell from 153.42 to a low of 1.32 where it sits right now. As conspiracy theories go, just how successful were "they" at "sealing" your shares? Fast forward to 2005. The new conspiracy theories just happen to be about Real Estate. According to this article, talk of bubbles in housing is a conspiracy by Wall Street to get you out of real estate and back into equities because "they are after your money". That's hilarious. Investment U was laughing about it and so am I. As for whether or not there is a bubble, "home sales as a percent of the economy are now at 17%. For the statisticians out there, that's 3.4 standard deviations from the mean. For the non-statisticians out there, speculation in home buying is literally off the charts. Said another way, it's not a Wall Street conspiracy that speculation in housing is at a statistical extreme; it's a fact." Hmmm. Is the real conspiracy (if there is one at all) the exact opposite of what people think? Are real estate agents in conjunction with lending institutions encouraging people to buy houses or condos they know (or should know) their clients simply can not afford? Are they encouraging sucker investments just as Mary Meeker and Henry Blodget hyped garbage at the top? After all, do banks or mortgage lenders or real estate agents care what the aftermath is as long as they get their initial cut? Who does care as long as mortgages can be dumped off on Fannie Mae? Fannie in turn "guarantees" the mortgage (trillions of dollars worth) and repackages the stuff selling it to pension funds looking for extra bits of yield. It's a great system for banks because they know Easy Al will come to their rescue just as he has done many times before. Nah, that can't be it. There are no conspiracies just paranoia. After all, "It's a totally new paradigm" and 3.4 standard deviations from the norm proves it. Now go buy that Florida condo before it goes up another $50,000 in "value" tomorrow. It's time to shift the arrow. "I think we don't expect prices to continue to rise at this pace, however, we don't see a bubble bursting either," he said. "I don't recall a real estate bubble ever bursting that wasn't preceded by bad economic conditions or some dramatic shock, and nobody is predicting any of that right now." "The interesting thing we're seeing is, it's a very stable, brisk market," said Steven B. Schnall, the president of the New York Mortgage Company, a mortgage lender. Mr. Schnall pointed to continued low interest rates as the most important factor in the market. "I don't see prices continuing to skyrocket," he said. "They've reached a very high level and this almost appears to be a new normal, and interest rates are helping that."